During the years of Prohibition, many homes, restaurants and former clubs were converted into "speakeasys". These secret establishments offered customers a chance to have a drink and perhaps listen to music out of the reach of the law. They garnered the colorful nickname of "speakeasy" because many such places were located inside of, above or below legitimate businesses and in these cases, customers who came for a drink had to be quiet or "speak easy". The name stuck for all such establishments, even those under the protection of law enforcement officials who found an envelope of cash would quickly convince them to look the other way. Perhaps the most famous former speakeasy in the Alton area was the famed "Hartford Castle", located near Cahokia Creek and the small town of Hartford. Although long gone today, thanks to a fire in the early 1970's, the stories of the place still linger, whispering of wealthy Frenchmen, tragic death, bootleggers - and ghosts. Lakeview, as the Hartford Castle was officially known, was constructed by a French immigrant named Benjamin Biszant in 1897. The castle-like house with the red-capped turrets was incredibly expensive, although the source of Biszant's wealth remains unknown. Most believe that he may have been an insurance executive, a contractor or an investor of some sort. Whatever his profession, he purchased a large section of land near Hartford and began construction on what was to be a "dream house" for his English bride. Teams of workers with horses were brought in and a moat was excavated around what would be the home site. The soil that was removed from it formed a rise on which Lakeview was built. When the house was completed, it boasted turrets that loomed high above the surrounding countryside and 14 rooms. The floors were made of imported cypress wood and the ceilings supported by hand-carved columns. Crystal chandeliers were used in mirror-lined main hall and music could often be heard drifting out over the fields in the evening. The landscaped gardens were decorated with gazebos and statuary and Biszant scattered his own concrete creations of animals and cannons about the grounds. A stone bridge was built to reach an island in the middle of one of the small lakes that adjoined the moat and the lakes were used for boating and swimming. Biszant stocked them with goldfish and once when high waters brought crappie into the lakes, they mated with the goldfish. Locals remembered some strange-looking fish in the water after that. Tragically though, Biszant's wife died in the early 1900's and he returned her body to England. After that, he lost interest in the castle, sold it and moved to California. Not long after, the ghost stories that became attached to the place began to be told. According to these tales, the lingering spirit was that of the Frenchman's wife, still haunting the place that she loved most in life. The ghost stories became a part of the house and they continued to be heard for years after, through various owners and even now, long after the house has been destroyed. The castle passed through the hands of several owners after Biszant sold it and was rumored to have been used at one time as a boy's military school and later as a school for unwed mothers. In the early 1920's, it was turned into a resort and during this period was believed to have been operated for a time as a speakeasy. The house was not far enough off the main roads that it could not be found and yet was secluded enough that the party-goers and gangsters who flocked to the place were not bothered. According to sources, the booze here was provided by the Shelton brothers for a brief time but its days as a speakeasy were numbered and the resort was later closed down. 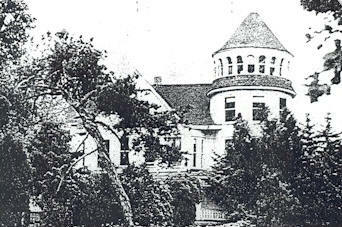 Shortly after, the castle was purchased by a couple from Wood River and they lived in the house until 1964. Soon after they moved in, they began to have problems with intruders and trespassers. The castle seemed to be viewed by the public as community property or a park and the owners stated that people would often just roam through the 35 acres at all hours of the day and night. Some even broke into the occupied house and wandered from room to room as if on a tour. The grounds were simply too attractive with the landscaped gardens and statuary for people to stay away. And like the gangsters of times past, teenagers often congregated in secluded spots on the estate for clandestine beer parties or searched out the best place to serve as a "lover's lane". Hoping to counteract this invasion of privacy, the family opened the grounds to the public on weekends for several years but eventually, this practice ended and the property was again closed down. In 1964, the owner died and his wife moved back into Wood River. There were attempts to rent the house after that, hoping that someone would just remain on the grounds to protect it from vandalism, but this provided little comfort since the maintenance on the house and property ended with the owner's death. 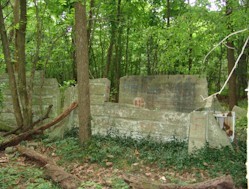 The place soon began crumbling into ruin and the lawn became thick and overgrown. By 1971, the house had fallen into disrepair and was showing signs of damage from thieves and vandals. The cruelest blow came the following year when intruders gutted the residence, ripped mantels from the fireplaces, broke windows and using a small telephone pole as a battering ram, smashed huge holes in the plaster walls. The senseless and stupid destruction led to the house being officially condemned by county inspectors. The final blow was dealt to the castle on March 21, 1973, when it burned to the ground. An alarm was sounded but by the time that firefighter arrived on the scene, only a tall chimney and burning embers remained of the once grand mansion. 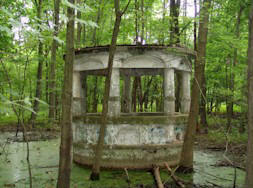 For years afterward, a small white gazebo still stood on the grounds where Lakeview once rested but it too has since been lost to time. 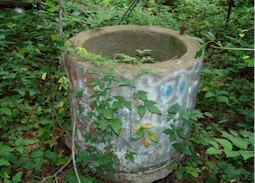 The site can still be found in a cluster of thick woods and brambles, just off New Poag Road on the other side of Hartford. 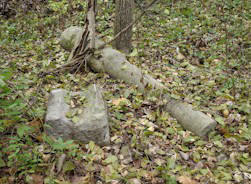 Only those who know of the place would have any clue that the ruins of the estate still remain as broken columns, a few pieces of shattered statuary and the dim outline of the castle's moat. This is a place that has been truly lost by time and one that, according to legend, remains haunted by the Frenchman's wife even today. There are those who maintain that her spectral form can still be seen wandering through the remains of the estate and that her voice can still be heard as she weeps for the life and the wonderful home that she lost. Others insist that old-time music can still sometimes be heard as well. They say that it floats through the trees and above the fields on summer nights when the crops are tall and when sound seems to carry for miles. Perhaps in another time and place, Lakeview still stands and the party still continues, beckoning to all of us from a distant memory that is now long since forgotten. 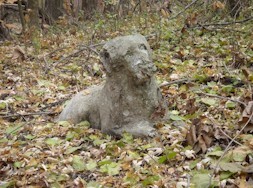 One of the last of the crumbling statues that still remain on the property. 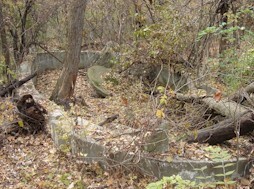 There were once dozens of them scattered across the grounds. 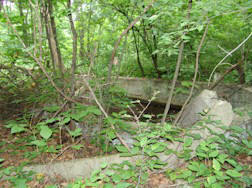 While there are no warning signs posted around the property (which abuts the railroad near Hartford), trespassing is not recommended on the site of the former castle. 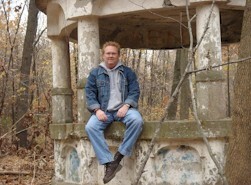 © Copyright 2007 by Troy Taylor. All Rights Reserved.